Over the last few months, we have been tweaking the conveyors offered on our website to offer a variety of options in a usable, easy-to-understand format. What we came up with is an online configuration system that allows great flexibility in changing the conveyor the way you want to change it. 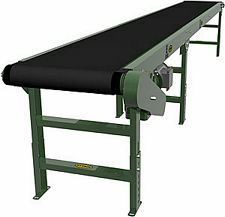 For instance, Hytrol Model TA Slider Bed Conveyors are available in over 1.1 million configurations. Take any single model – say this one – which is a basic 14″ overall width, 16′ long belt conveyor, and you can configure it hundreds of different ways, from belt type to support heights to motors and guardrail (that doesn’t count speed settings, which would pump that count up to 17 million). Of course, we also believe in old-fashioned customer service, which is why we are always available through our toll-free line, chat function and email service. We can help you specify precisely the right conveyor for your needs.